5 June 2018: Zenith seminar, Montpellier: Daniel de Oliveira (UFF) “Parameter and Data Recommendation in Scientific Workflows based on Provenance”. 19 June 2018: Ph.D. defense of Vitor Silva “Analysis of raw data from multiple data sources during the execution of computational simulations”, Advisors: M. Mattoso, D. de Oliveira and P. Valduriez, UFRJ, Rio de Janeiro. 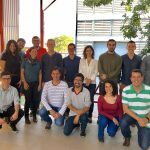 27 August 2018: SciDISC meeting at the First Latin America Data Science Workshop (LADaS 2018, http://eic.cefet-rj.br/ladas2018), in conjunction with VDLB 2018, Rio de Janeiro. The workshop gathered more than 60 participants. 27/8-31/8/2018: VLDB 2018 conference (http://vldb2018.lncc.br), Rio de Janeiro. The organization of VLDB 2018, the top international conference in database management, is a major outcome of the SciDISC project, with key positions held by members of the project: F. Porto: general chair, P. Valduriez: sponsor chair and many SciDISC members in the local organization. E. Ogasawara and P. Valduriez were chairs of the LADaS VLDB workshop. E. Pacitti was chair of the VLDB workshop on Big Social Data and Urban Computing (BiDU). The VLDB conference was a great success with about 700 participants. 19 dec 2018 : 2nd SciDISC workshop, NACAD/COPPE/UFRJ, Rio de Janeiro. 19 dec 2018: colloquium COPPE/UFRJ by P. Valduriez: Blockchain 2.0: opportunities and risks, https://www.cos.ufrj.br/seminarios. 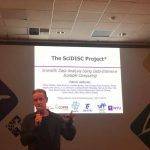 27 january 2017, SciDISC seminar by Fabio Porto (LNCC) “Database System Support of Simulation Data”, Zenith, Montpellier. 30 january – 2 february 2017: meetings during the HPC4E H2020 project review in Sophia Antipolis with A. Coutinho (COPPE/UFRJ), M. Mattoso (COPPE/UFRJ), H. Lustosa (LNCC), F. Porto (LNCC), J. Liu (Zenith) and P. Valduriez. 1 june 2017, SciDISC seminar by Fabio Porto (LNCC) “Simulation Data Management”, Zenith, Montpellier. 17 july 2017: meeting CEFET/RJ – FGV – Zenith, Rio de Janeiro, on a joint research project related to mobility, with E. Pacitti & P. Valduriez (Zenith), E. Mendes (FGV), M. Silva (FGV), Renato Souza (FGV), E. Ogasawara (CEFET/RJ) and both master degree and PhD students: A. B. Cruz (CEFET/RJ), F. Britto (CEFET/RJ), H. Borges (CEFET/RJ), and B. Prallon (FGV). 20 july 2017: 1st SciDISC workshop, NACAD/COPPE/UFRJ, Rio de Janeiro. Participants: P. Valduriez, M. Mattoso, A. Coutinho, J. Camata, V. Silva, F. Porto, H. Lustosa, D. Gaspar, E. Pacitti, H. Borges, A.B. Cruz, J. Ferreira, E. Ogasawara, D. de Oliveira, R. Souza, K. Ocaña, W. Vieira. 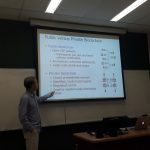 26 july 2017: Colloquium of PESC/COPPE, UFRJ by P. Valduriez on “Data Science: opportunities and risks”. 27 november 2017: workshop CEFET-FGV, Rio de Janeiro, with E. Pacitti and P. Valduriez, E. Mendes (FGV), M. Silva (FGV), Renato Souza (FGV), E. Ogasawara (CEFET/RJ) and both master degree and PhD students: A. B. Cruz (CEFET/RJ), F. Britto (CEFET/RJ), H. Borges (CEFET/RJ), and B. Prallon (FGV). 14 december 2017: SciDISC seminar by Marta Mattoso (COPPE/UFRJ) “Human-in-the-loop to Fine-tune Data in Real Time”.